The Redwood B2 5-String 24 Bracket Banjo is a superbly crafted instrument that is perfect for beginners and those who are totally new to the banjo, who are looking for an easy to play and highly accessible instrument to get them started. The body is crafted from a warm-sounding mahogany, reinforcing the lower frequency power of the B2. The pot is a plain wood with 24 flat-type bracket hooks, giving you a great level of control over the top head tension. The top head is a resonant 11" Taiwan Remo white coated head, which perfectly projects the delightful tones produced in the body. The high gloss finish protects the body from unwanted scratches and knocks that can come whilst performing. Married to the body is the comfortable nato set neck, which is accompanied by a smooth black walnut fingerboard - home to 22 delightfully playable frets. The neck plays very evenly and running your fingers along the fretboard is an absolute pleasure. Pearloid inlays adorn the fingerboard, guiding your way with vintage style. Tuning integrity is upheld by open-geared tuning machines with high-gear ratio, offering peerless reliability. A nickel-plated brass tailpiece ensures the strings meet the body in the most secure way possible, giving them the ability to endure whatever you throw at them whilst performing. The Redwood B2 5-String 24 Bracket Banjo is an excellent instrument. 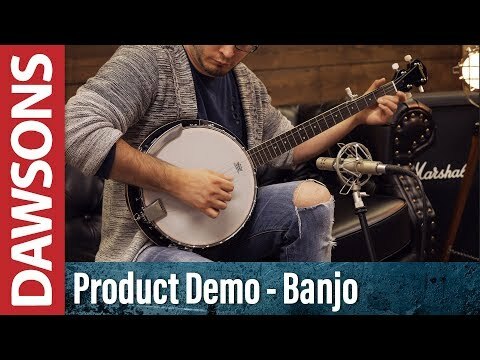 Every effort has been made to deliver the highest quality banjo possible at the most affordable price possible so that more people can appreciate the rewarding world of playing this versatile instrument.